Blake Garden is a delightful mixture of flowers and paths and formal areas, brimming with dragonflies and insect life. I’m still working on this painting. Initially I used really vibrant, vital greens which I then thought looked artificial so I toned the whole thing down, only to realize when I got home that I’d killed it and so I’m slowly bringing back the sunlight. I’m returning to Blake Garden tomorrow to look and paint again and I’ll do the same view on another canvas and then post the results for comparison. Blake Garden, Kensington, East Bay CA. 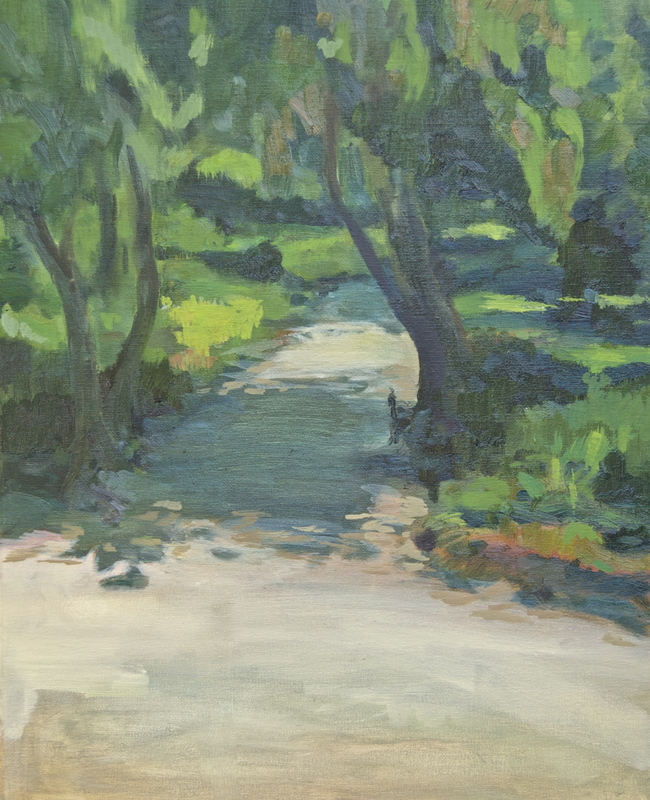 This entry was posted in Art Journal and tagged Blake Garden, East Bay, Fran Osborne, landscape, oil. Bookmark the permalink. What a nice discovery (surfing tag surfer). Where exactly is Kensington, CA? I just googled but it brought about the United Kingdom, is it in Cambridge? Hi, Kensington is just east of Berkeley in the east bay and the garden is open to the public Monday to Friday only, located at 70 Rincon Road in Kensington. Their phone is (510) 524-2449. From Berkeley it is a left from North Arlington. Watch carefully for the inconspicuous entrance and sign on Rincon Rd. http://laep.ced.berkeley.edu/blakegarden/ Enjoy. Wow, just when you thought you knew the entire Bay Area, i can only say “Almost!” Thank you. I will check it out this Summer.